I have decided that every month of June shapes up like this one, I will pretty much declare myself to be on sabbatical and just post occasionally when I can. I was on travel so much, and pretty much frazzled when I WAS at home or in the office. So: catching up on things, mostly my self-imposed or self-caused deadlines. 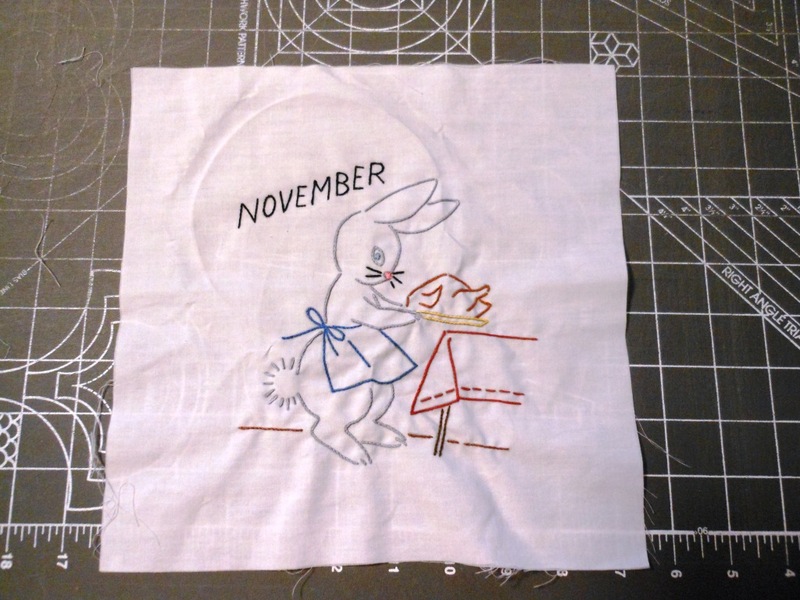 I am done with the November bunny block, and have started on the December one. I had hoped to have that one done by tonight but other things got in the way. Plus I prefer that there be something interesting on TV to listen to while I embroider. Could have maybe finished it if we had stayed home to watch the golf tournament, but we went to the movies to see Men in Black Three instead, which was very good, way better than the 2nd one and almost as good as the 1st one. Here is the November one. It is kind of disturbing that a herbivore is cooking up another herbivore for Thanksgiving dinner, but I guess these aren’t realistic blocks, after all the rabbit IS wearing an apron. 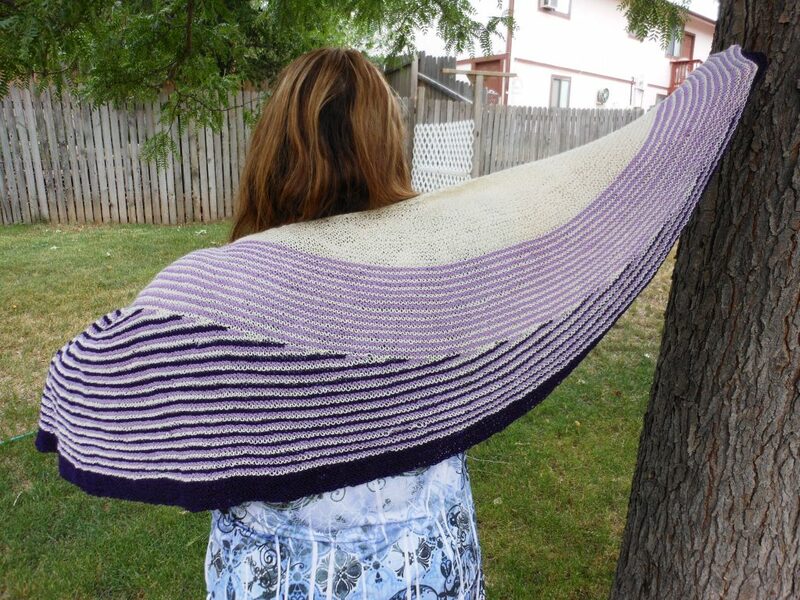 I also got my Color Affection Shawl done in time for the Camp Loopy (online summer knitting camp, yes I know I am nuts) deadline, and got it posted. 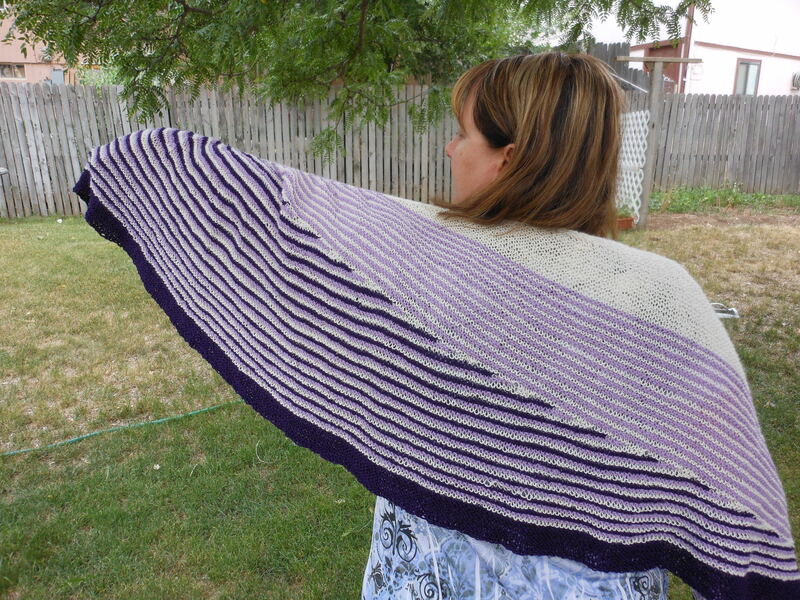 It still needs blocking, and I have some loops that got pulled and need to be worked back in evenly, but it is done. I am not completely happy with the shape right now, but I think blocking will help that. 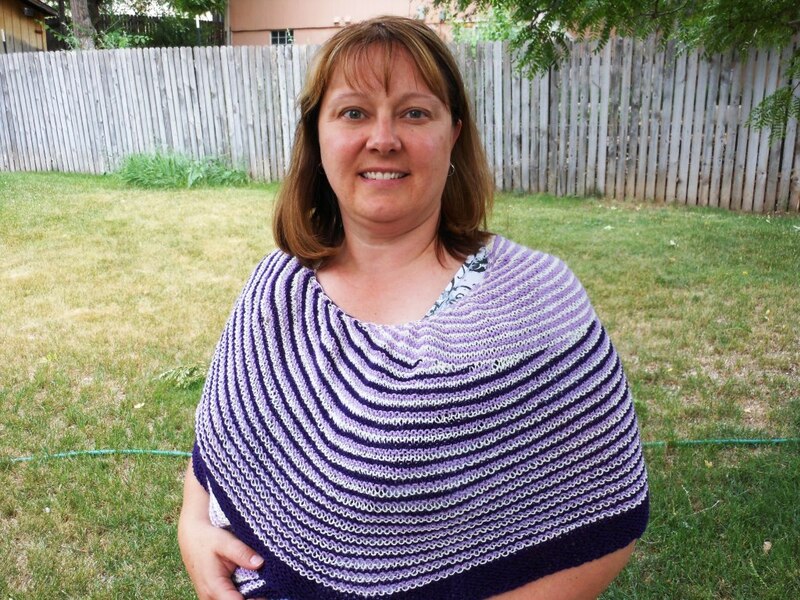 For my next project, I am going to crochet a baby blanket. I am going to use my “default” pattern that I use when I need a baby blanked quickly for a gift. That is not the case this time, but I do need a project that I can get done in a month and still stay sane. And we recently learned that we are going to have a new niece or nephew in late December or early January, so this will be something I can have done in advance. If I get it done in time I will enter it in the Boulder County Fair as well. I also got in some work this weekend on the pieced quilt for the niece that just turned one. Would like to get that one done and quilted and entered in the fair, and then sent to her. I need to catch up on the baby quilts if there is going to be another baby! My office decided to take Monday off instead of the actual 4th, so we have a three-day weekend. I am going to spend the day 1) Getting Leo the cat shaved for the summer, 2) getting the piano tuned, and 3) running errands and hopefully getting some sewing/embroidery/knitting done. Will report on the garden and other projects later this week. Also, expect pictures of an angry but short-haired cat. This entry was posted in Crafting, Embroidery, Knitting by glenderella. Bookmark the permalink.